Fire Prevention Week turns up heat! 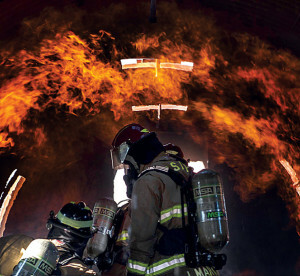 Jason Martinez, 99th Civil Engineer Squadron Fire Protection Flight firefighter, stands in the mock shell of an aircraft while performing controlled burn training at Nellis Air Force Base, Nev., Oct. 6. The Nellis-Creech Fire Department hosted events throughout Fire Prevention Week to educate and bring awareness to the importance of fire safety. 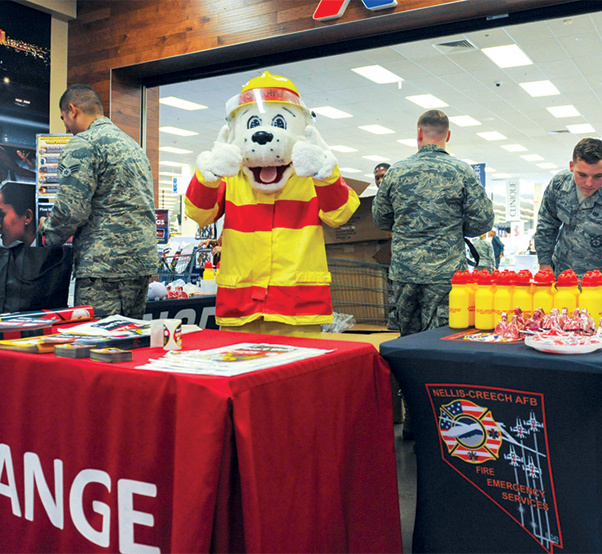 NELLIS AIR FORCE BASE, Nev. — Fire Prevention Week was held from Oct. 9 to 15. This year’s campaign, “Don’t Wait – Check the Date! Replace Smoke Alarms Every 10 Years,” represented the final of a three-year effort to educate the public about essential elements of smoke alarm safety. The Nellis-Creech Fire Department hosted events throughout the week to educate and bring awareness to the importance of fire safety. “This year Nellis and Creech Air Force Bases began our events for Fire Prevention Week by participating in the National Night Out at the Nellis Housing Community Center,” said Norman Harp, 99th Civil Engineer Squadron fire inspector. “The Air Force is really good at making sure we don’t have fire incidents on base and the biggest reason is because of our fire prevention program,” said Tech Sgt. Justin King, 99th CES NCO-in-charge of logistics. According to Harp, some of the most important tips to keep in mind when it comes to fire prevention include: in the event of a fire or a medical emergency dial 911, have an escape plan and know what to do if you have a fire (extremely important for children), make sure you have a meeting place, test your smoke alarms monthly and make sure they are working properly. If your clothes catch on fire: stop, drop and roll. Other events included: Oct. 11, NCFD visited Coral Academy of Science Las Vegas and brought a fire truck and did tours for the students. Sparky the Fire Dog was there and gave out some Fire Prevention items. Sparky the Fire Dog and members of the 99th Civil Engineer Squadron Fire Protection Flight set up a booth at the base Exchange on Nellis Air Force Base, Nev., Oct. 12. Fire Prevention Week served as an opportunity for the NCFD to present a fire safety message to help keep the people that live and work on Nellis and Creech safe. On Oct. 12, NCFD was at the Child Development Centers with a fire truck and Sparky. Also, they had a fire truck on display, Sparky and their free giveaway tent set up at the Nellis AFB Exchange. At Creech AFB, they visited Indian Springs Elementary School in the morning. On Oct. 13, NCFD was at Creech AFB and they had a table set up at the Creech Dining Facility Administration Center. Their tent was at the Creech Shoppette where they gave away promotional items. In addition, the NCFD hosted an open house at Fire Station 1 on Nellis AFB, where they gave tours of the fire station to anyone who stopped in. Fire Prevention Week wrapped up Oct. 14 at Creech AFB. The day began with a 5K Color Run and then the annual fire muster at the Creech athletic field. The fire muster included a community information fair and chaplain’s barbecue. Fire Prevention Week served as an opportunity for the NCFD to present a fire safety message to help keep the people that live and work on Nellis and Creech AFBs safe.